In a webinar sponsored by American Well and hosted by Becker’s Hospital Review, Children’s Health of Dallas, Children’s Hospital & Medical Center of Omaha and Pediatric Associates discussed how their organizations are revamping care through pediatric telehealth. For Children’s Health of Dallas, telehealth provides care access to both rural and urban patients, particularly for the Medicaid population. Patients often have to take several bus rides or spend entire days traveling to one medical appointment, and nearly one in five Dallas County children are uninsured, prompting a number of patients to seek care in the health system’s emergency rooms. Children’s Health, which began its pediatric telehealth program in 2013, now provides virtual care across numerous service lines, from blood disorders to school telehealth. The school telehealth system is implemented in more than 100 schools across Texas and is the largest school-based telehealth program in the country. Children’s Health of Dallas has also expanded the reach of virtual visits through telehealth kiosks in local pharmacies and community residential sites. The health system partners with Dallas-based Dougherty’s Pharmacy on telehealth kiosks, with its first kiosk launching in 2016. Learn more about Children’s Health’s telehealth program here. Children’s Hospital & Medical Center of Omaha, which cares for more than 250,000 children annually, is using pediatric telehealth to address the limited access to psychiatric care in Nebraska. 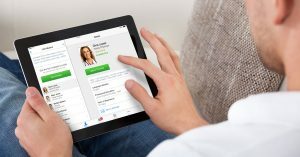 “When we started thinking about telehealth about three years ago, our new CEO, who was an advocate for telehealth, guided us toward recruiting Dr. Jennifer McWilliams to lead as our physician champion for psychiatry,” said Michael Vance, PhD, director of behavioral health services at Children’s Hospital & Medical Center of Omaha. For Jennifer McWilliams, MD, a child and adolescent psychiatrist in Children’s of Omaha’s department of behavioral health, telehealth serves as a tool to more easily connect patients to providers rather than entirely altering how providers deliver care. 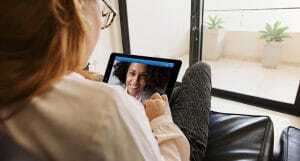 The hospital’s virtual visits for psychiatry have significantly increased, with 600-plus telepsychiatry visits conducted since the program’s launch. “I provide care via telehealth about half the time but could easily begin providing care via telehealth 100 percent of the time,” says Dr. McWilliams. Since its inception, the pediatric telehealth program helped reduce Children’s of Omaha’s follow-up no-show rates by 50 percent. Read more about Children’s of Omaha’s telehealth program in this case study. Pediatric Associates, which cares for approximately 500,000 patients, implemented pediatric telehealth services to triage patients and help with ER diversion. 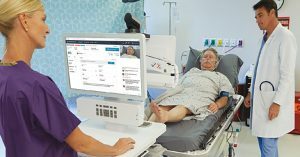 Pediatric Associates providers staff the group’s telehealth system and created triage protocol to determine the best site of care for each patient to lower unnecessary ER visits. “All of our appointments made through telehealth are triage-based, and patients can continue to be scheduled through our existing phone system,” says Amy Verlsteffen, director of the patient contact center for Pediatric Associates. The group has four full-time telehealth physicians available from 7 a.m. to 11 p.m. on weekdays and 3 p.m. to 11 p.m. on weekends. To learn more about Pediatric Associates triage-based pediatric telehealth program, click here.